It's the holiday season, and a weird one at that, as movies are shuffled around in an attempt to capitalize with Star Wars on the approach. After a few drops from my theater, yours truly finally got a new film in to review. 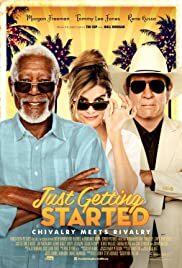 Today's focus is on Just Getting Started, a retirement community film with the legendary Morgan Freeman and Tommy Lee Jones leading the way into what is hope to be comedic fun. Can the time-honored veterans bring this film up to code, or does it fail like so many comedies this year? Robbie K is back with another review to help guide your viewing pleasure. Here we go!